The WLT Membership Program is a unique approach to conquering your weight forever. This faith-based program incorporates a Spirit, Mind & Body Approach to tackling your weight issues, once and for all. You’re ready to try something new that actually works – no diets, detoxes, or pills or deprivation. If you’re ready for a transformation, then the WLT Membership Program is for you! Join now and get your transformation started! Click on this link to start your trial! 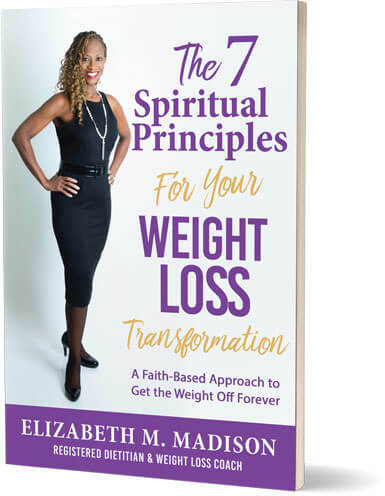 A free copy of the 7 Spiritual Principles for Your Weight Loss Transformation: A Faith-Based Approach to Get the Weight off Forever Book or Workbook (you will receive your copy after the 15th calendar day of your first full membership month). Just For You Meal Plans. The meal plans are nutritious, healthy, balanced, and most of all, delicious! You can tailor these delicious meal options to fit in the foods you love. A 30 Day Jump Start Plan is included that will maximize your weight loss. WLT Live Workshops. Two live, virtual workshops are scheduled monthly. These dynamic, interactive group sessions give you wraparound support! Each workshop topic fortifies your journey with practical knowledge. And there’s always time for Q&A. Prayer and meditation time is built in to increase your spiritual fitness. Members support each other by sharing their victories and challenges. Encouragement is overflowing. Can’t make the workshop? Recordings available on demand. 7 Spiritual Principles Daily Inspiration. Each morning you’ll receive motivational messages via your email inbox. These daily messages keep you connected to the WLT program and give you the tools you need to build your wellness foundation. WLT Nutrition and Wellness Library. This is a comprehensive resource designed to deepen your understanding of the 7 Spiritual Principles for Permanent Weight Loss. to You’ll find topics ranging from Super Foods to mindful eating to empowerment scriptures. New articles and videos are posted regularly! Q&A Help Desk. Need help with the program? You can email the Help Desk for support! WLT Wellness Challenges. We like to keep things fun and interesting. Feel free to join the challenges that will keep you motivated!